Plymothian Transit: Saltash to loose out? Saltash to loose its 152 service?. I was intrigued to see a 'tweet' that suggested that Saltash was to loose its direct bus service to Derriford Hospital. Saltash may lose the only direct bus service to Derriford Hospital. 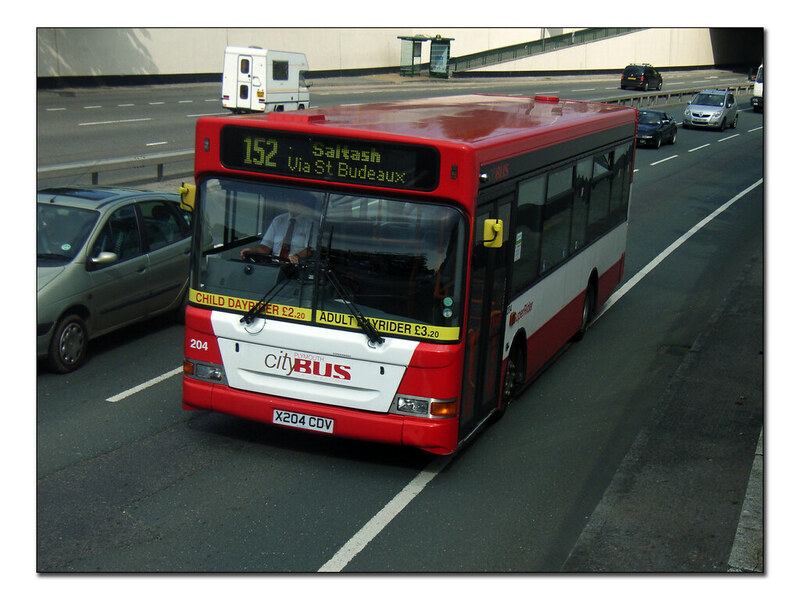 Saltash Town Council has confirmed that the 152 bus may be scrapped in the near future but this is not definite. An alternative is being put forward to have a bus route that goes around the Plymouth city centre before ending up at Derriford Hospital. This will lengthen the time that the bus takes to get to the hospital. The worry of the loss of the 152 bus route highlights the insecurity and confusion that the sale of CityBus has caused to the changes in the normal bus routes. The article links to Saltash Council although there is nothing on their web site about any such change to the 152. There have not been any route registration changes made by Plymouth Citybus yet so I guess its still up in the air rather than a firm plan. The 152 does seem to be a popular service, at least at morning and evening peak times, with a standing load on a Dart not uncommon as it leaves Derriford at 'home time'. I am also a little confused by the suggestion that an alternative route that goes around Plymouth City Centre before ending up at Derriford Hospital. There are already plenty of buses going from Saltash to the City Centre, and the City Centre - Derriford route is also pretty well served as it is so I cant see the need for a new route? The final line is a classic especially as there have till now been no changes to any routes what so ever by Plymouth Citybus, and marginal routes such as the 152 would have been no more guaranteed by a council owned Citybus than a Go-Ahead owned Citybus. Indeed the last set of route reductions in Plymouth were actually completely down to Plymouth City Council itself! Plymouth Local History - St Budeaux Carnival - a reminder of summer! 11:01 X80/180 SERVICE DISRUPTION: Accident on A38 between Lee Mill & Ivybridge. Police & Fire Brigade suspect road will be closed all day. Service X80/180 will therefore be diverted via Old Cornwood Rd, past back of Tesco, Cadleigh then through to Lee Mill before continuing normal route. Delays expected. Updates to follow when further information comes through. 11:55 A38 ACCIDENT UPDATE. Unfortunately service 180 has been suspended until further notice as the traffic has been at a complete standstill for the last 50 minutes. Traffic is tailed back to Marsh Mills and in the opposite direction back past Wrangaton. We apologise for any inconvenience caused due to circumstances beyond. 12:46 A38 ACCIDENT UPDATE: The A38 has reopened. The 12:40 serv 180 journey from Plym Bus Station & 1328 journey from Ivybridge Cole La will serve the normal service 180 route, although please be aware some delays to journeys for the time being are likely while traffic backlog cleared. All X80 journeys departing from Torquay & Plymouth will now be instructed to follow normal route. 18:57 It's snowing again! Plymouth & South Devon: Due to an accident on Tavistock Road there are likely to be severe delays and disruptions to services PR1, 7, 15, 17, 83, 84 & 86 (there is also a lot of snow slush on roads) As of 1830 Manadon Roundabout and Tavistock Road was gridlocked. Service 7 is also unable to serve Marjons and also cannot serve Pick pie Drive operating as far as the Tesco Roundabout. Will update as conditions deteriorate/improve. Although all other services are still operating in Plymouth there may be some slight delays where drivers execute caution as road conditions deteriorate due to snow in some areas. There are also likely to be severe delays on the X80 as we've just had reports there is a tree on the road at Rattery Mill on Totnes Road. The service is also not able to serve South Brent and Twigley Cross due to road conditions. In Torbay due to heavy seawater on road along Torquay seafront the X80/X81 will be diverted via Preston before/after serving The Strand/Torbay Hotel. In South Devon service 76 is still operating but no longer able to operate via Ashton and St Dominic due to snow. 19:06 NORTH DEVON SERVICE DISRUPTION The X9 is stuck in snow in Okehampton . Police are attending the scene. Therefore no further X9 journeys can operate today. We apologise for any inconvenience caused. 06:03 Good Morning. ALL SERVICES, SCHOOL BUSES, GRAMMAR SCHOOL, AND COLLEGE BUSES, WILL OPERATE NORMAL ROUTES however based on driver reports from yesterday afternoon we still cannot serve St Dominick, Milton Combe, the Leg of Mutton, Wotter Village, and St George's Road Saltash. 09:35 St George's Road in Saltash is now open and the 152 service has reverted to the full route. 10:19 We have restored the service 31 to its full route. At the moment there are no diversions or restrictions for any PCB stage carriage services in the City. Restrictions still apply in Wotter for the 58 and 59 and at Milton Combe, and St Dominick for the school buses. 16:59 Due to the weather and the traffic problems at Derriford Hospital there is significant delays to all buses operating in the City. We are doing what we can to get you home but your bus may be subject to long delays. All city routes are running with care but are subject to long delays and hold ups as described. 18:03 It is chaotic in the City and beyond due to the weather and the traffic disruption at Derriford Hospital. Our staff are doing what they can to get you home. There will be major disruption, delays, and possibly buses missing from our evening services and we suggest that if you do not need to go out you stay indoors in the warm and dry. We apologise but these events are completely beyond our control. 21:17 Visit the NOTES tab for details of services for Wednesday All bus services in Plymouth will operate as normal Because students are taking exams we decided to operate all school buses but some will only serve the main road We would rather do this than have a bus stuck with students trying to get in for their exams Sorry but there will be no service on 58 or 59 until we can check the route later in the morning.